240 EUR/4 pc. | 720 EUR/4 pc. 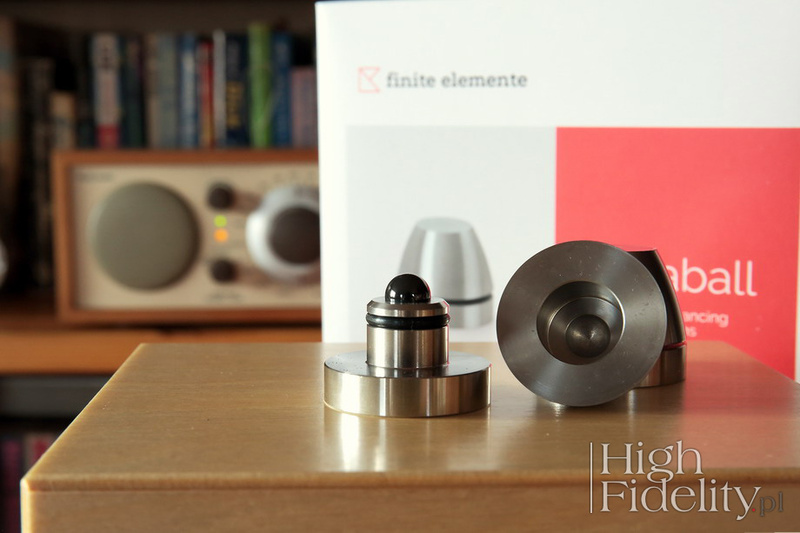 have a soft spot for FINITE ELEMENTE products (the company uses lowercase letters for their name: 'finite elemente', but I will stick to the normative spelling: 'Finite Elemente'). I got to know them quite a long time ago and immediately got enchanted by them on the one hand with a perfect make and finish, and on the other with the technical expertise used to create them. | Finite Elemente and "High Fidelity"
At a time when the company was taking its first steps, talking about "anti-vibration feet", "anti-vibration platforms" or "anti-vibration racks" resembled a discussion about UFOs. 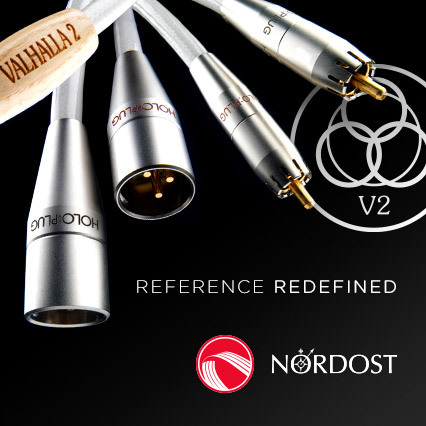 No one in the world of technology believed in it, and in the world of audio it took a lot of effort to convince anyone to even make an effort to try these products out. We did it in January 2008, when together with the Krakow Sonic Society, during the 51st meeting we tested a number of different insulators, including three made by FE: CeraBall Universal, CeraPuc and CeraBase (KTS | No. 45). The results of assessments were clear and repeatable, and as a result of this test some of us bought these feet for our devices - for years I used them under the Ancient Audio Lektor AIR V-edition CD Player. But they were not alone in my system. In December 2013, the object of my audio dreams materialized in my room, and I've been enjoying it ever since – the Pagode Edition rack (HF | No. 116). Although I can see some things that should be improved in it - primarily counter-tops - as a whole it is still an object of applied arts as well as a great tool. One of the strengths of Finite Elemente products was solid knowledge they were based on and the ability to use it properly. For example, when developing the Pagode racks, FE engineers cooperated with scientists from the Fachhochschule Dortmund (University of Applied Sciences in Dortmund). 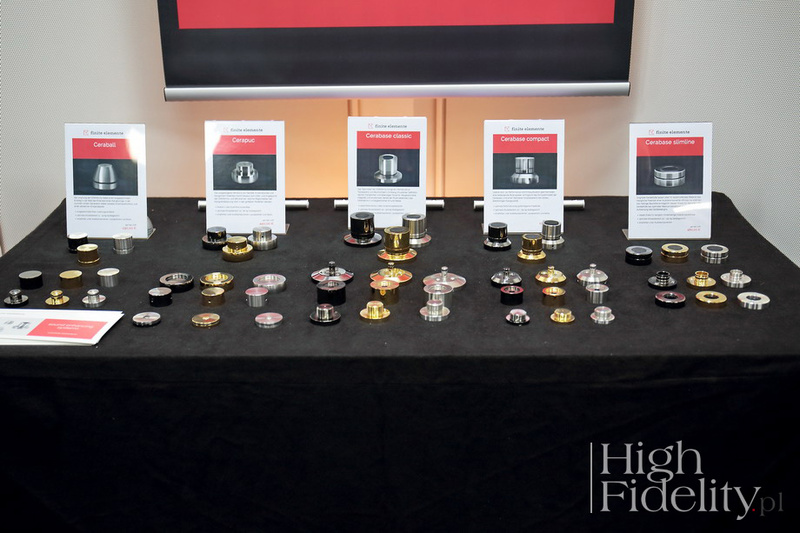 The team measured and optimized these products, and prepared the theoretical foundation contained in the document entitled Sound optimization of hi-fi racks using resonator technology. The Advanced platform is a unique solution because it contains a second, next to pneumatic, level of vibration damping based on roller bearings. It improves significantly decoupling of vibrations in horizontal plane and in this way the STACORE ADVANCED gains so-called six-axis vibration decoupling – a Holy Grail of vibration control systems. The Stacore company used tungsten carbide balls in its design, but the principle is the same as in Finite Elemente feet and it is also this German company that inspired such brands as: Franc Audio Accessories, Pro Audio Bono and HiFistay. The renewed and restructured Finite Elemente currently offers only five products, only feet, and we will have to wait for re-implementation of the platforms and racks. The entire series of feet is called CERAfamily and it includes: the largest Cerabase classic, Cerabase compact, Cerabase slimline, Cerapuc and Ceraball. This is the third generation of these products. Now their body is made of polished stainless steel, but there are also "special" versions available with 24-carat gold plated brass and black-chromed brass. As Mr. Luis Fernandes told me, company's boss, each of them sounds different. The new version of feet has also received a different type of packaging. Over the years, we have become accustomed to FE products coming in handy, damage-resistant plastic trays. New are delivered in a wooden box, put inside a cardboard box. Cerabase classic is FE's top model. The feet are quite high, they measure 50-60 mm high (height is adjustable) and although the company sees them in "all applications", they will find their place where you require them to be able to support a big weight - they are specified in the range from 50 to 500 kg while using four feet; when using three of them the maximum lifting capacity drops slightly to 375 kg. Considering such big weights we are actually talking about loudspeakers, anti-vibration racks and large power amplifiers as most likely applications. They are made of three steel elements, three balls and an auxiliary element. So there is a wide, "foot-like" base – the whole design rests on it. There are three half-spheres for three balls milled in it - this is the main decoupling element or, as Mr. Fernandes says: coupling points. The base is milled with a pin that features a rubber ring - this is the only element that after several years of using should be checked (rubber wears off over time). On top of this pin one puts a cylinder threaded from the top. Due to the thread, one can adjust the height of the foot, and thus level the device placed on it; the adjustment range is 10 mm. From the top one puts a rubber disc on the foot, which prevents the device from slipping; the rubber disc hides halfway in the sub-sphere. But one can also screw the feet to the component or speaker. The set includes M6 and M8 screws. Ceraball are smallest feet in FE's range. They have a characteristic shape of a truncated "bullet", also used by the Polish company Pro Audio Bono. 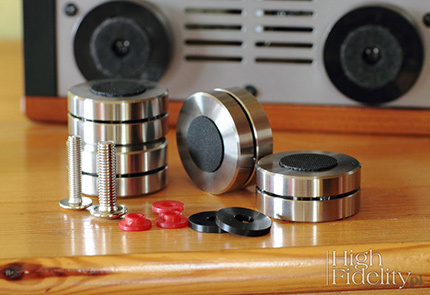 They are conceived as a support for small devices and speakers. The manufacturer claims optimal weight of 5-40 kg range, but the permissible loads are much higher - 300 kg for a set of four feet and 225 kg for three. They are 30 mm high, so they will not dominate the look of the device: the wider part has a diameter of ø 55 mm and the narrower of ø 35 mm. 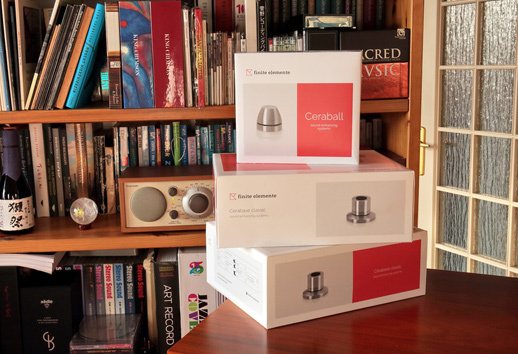 Just like Cerabase classic feet, the Ceraball's height can adjusted within 10 mm range.